Mary Anne Marsh, a principal of the Dewey Square Group, a Democratic public affairs consulting firm, told America’s Newsroom on Monday the Hillary Clinton campaign fears Republican Donald Trump. Hillary Clinton and Donald Trump have already turned their sights to each other. You heard that after New York last Tuesday night. You’ll hear it again tomorrow night… I’ve consistently said throughout the analysis of this race that I would not want to run against Donald Trump because I think he’s the most dangerous candidate. 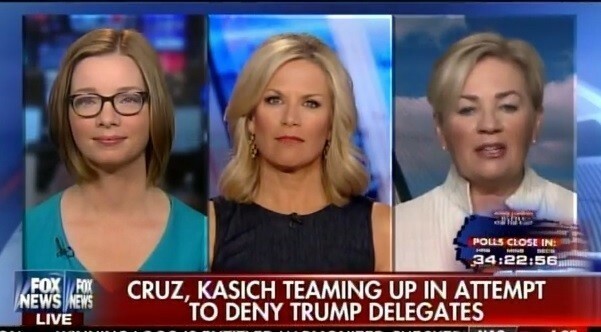 Give me Ted Cruz, give me John Kasich, give me any of the vanquished they’re traditional politicians, easy to beat. And, Ted Cruz, in particular, way outside the mainstream. Donald Trump, when you look from what he said the other day about the gender bill and using the bathrooms, it proves that point because he knows how to appeal to not only Libertarians but to Independents who support that, too. So it will be a very, very tough candidate to face in a general election. I think it will be one of the closest elections we see since 2000.